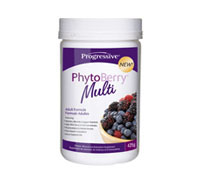 PhytoBerry Multi features a strategic blend of over 70 foundational nutrients, including the entire spectrum of vitamins, minerals and support nutrients in Progressive MultiVitamins, along with the complete family of high ORAC berry and fruit concentrates, phytonutrients, antioxidants, herbal extracts, EFAs and essential oils in PhytoBerry. Each of your individual organs and internal body systems (digestive, circulatory, lymphatic, etc) has unique antioxidant requirements. PhytoBerry+ is designed to offer whole body antioxidant protection by using a combination of nutrients that work together to target each organ and system, protecting you from head to toe, inside and out. For best results, combine with VegeGreens Multi for all your fruits, all your vegetables and all your vitamins & minerals!